Jonathan Charteris-Black is Professor of Linguistics at the University of the West of England, where he has developed a range of new courses relating to Critical Discourse Analysis and Metaphor. 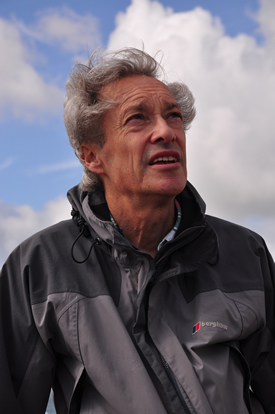 He obtained his PhD at the University of Birmingham and taught at the University of Surrey. He is the author of Corpus Approaches to Critical Metaphor Analysis (Palgrave, 2004); The Communication of Leadership (Routledge, 2007); Gender and the Language of Illness. (Palgrave, 2010); Politicians and Rhetoric: The persuasive power of metaphor (Palgrave, 2nd Edition, 2011). He is on the editorial board of Metaphor and the Social World. 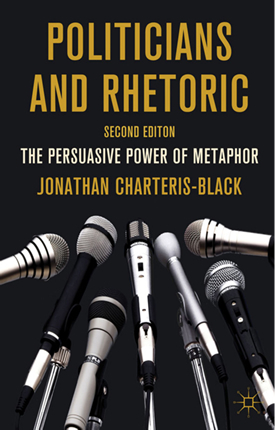 The book analyses the metaphors in the political speeches of 9 British and American Politicians using critical metaphor analysis (proposed originally in Corpus Approaches to Critical Metaphor Analysis). The book is a second edition of my 2005 book but contains significant additions – a theoretical chapter on metaphor in political communication and completely new chapters on Enoch Powell, Ronald Reagan and Barack Obama. It proposes a new theory of persuasion that integrates the classical trilogy of ethos, pathos and logos with contemporary influences on myth making arising from cognitive theory and the media. It is around 50% longer than the first edition and contains a fuller bibliography. What insight does metaphor analysis provide into the myths created by great political orators? Each chapter is based around a corpus of speeches by a particular politician: Churchill, Martin Luther King, Powell, Reagan, Thatcher, Clinton, Blair, Bush, Obama. First I present a profile of the politician that seeks to bring out their symbolical appeal: the central ‘story’ that they told. Then I analyse the full range of rhetorical strategies, this is followed by a detailed analysis of their metaphors and identification of their major conceptual metaphors. From a combination of these analyses I complete each chapter by proposing a predominant myth for each politician. The book demonstrates the value of detailed and systematic analysis of particular rhetorical strategies and metaphors and how such empirical analysis can reveal underlying narratives. It shows how persuasiveness arises from an interaction between metaphors and other rhetorical strategies and suggests that ‘journey’ metaphors are central in creating political myths. Multiple worked examples illustrate the continued relevance of rhetoric and the importance of taking political oratory seriously. It is hoped that anyone interested in political oratory – theoretically, analytically or practically – will learn a great deal by reading this book in a way that will contribute to their future as critics, speechwriters or even politicians! The book extends the scope of the first edition by developing further a theory of persuasion and rhetoric and extending the analyses to a wider range of politicians. This demonstrates the continuing relevance of mythic thinking in political discourse. The methodological approach illustrated in the book can be extended to a wider range of politicians – especially to female politicians and to those working in non-western settings. Such an enterprise was commenced in The Communication of Leadership. But there is no limit to the range of contexts that the methodology can be applied. It could also be used to explore issues of whether there are predominant myths of the political left and right (see Lakoff’ claims regarding Strict Father and Nurturant Parent metaphors). A further exploration could be into the influence of situational factors, such as political crisis and topics such as immigration, globalisation and climate change. Methodological approaches for investigating these are described in detail in the third section of my 2013 book Analysing Political Speeches.